(i) A quadrilateral is a polygon that has four sides (or edges) and four vertices (or corners). It can be any four-sided closed shape. (i) In a quadrilateral ABCD, the four line segments AB, BC, CD and DA are called its sides. (ii) The vertices of a quadrilateral are the corners of the quadrilateral. A quadrilateral has four vertices. 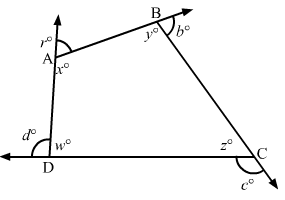 (iii) The meeting point of two sides of a quadrilateral is called an angle. A quadrilateral has four angles. 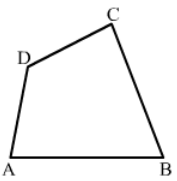 (iv) In a quadrilateral ABCD, the line segments AC and BD are called its diagonals. (v) The angles which have a common side as their arm are called adjacent angles. (vi) Two sides are adjacent if they have a common endpoint. (vii) Two sides are opposite if they do not have a common endpoint. (viii) The two angles of a quadrilateral which are not adjacent are called opposite angles. (ix) The part of the plane made up by all such points that are enclosed by quadrilateral is called the interior. (x) The part of the plane made up by all the points that are not enclosed by quadrilateral is called the exterior. (i) A quadrilateral has ….. sides. (ii) A quadrilateral has ……. angles. (iii) A quadrilateral has …….. vertices, no three of which are ……..
(iv) A quadrilateral has …. diagonals. 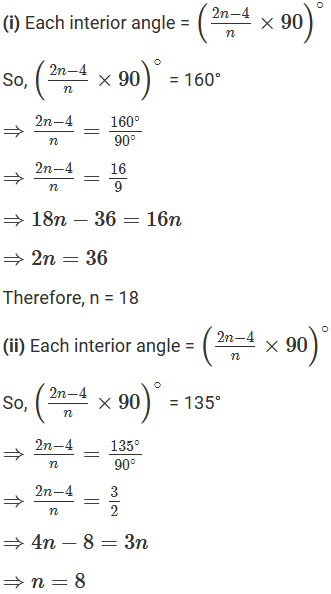 (vi) The number of pairs of opposite angles of a quadrilateral is ……. (viii) A diagonal of a quadrilateral is a line segment that joins two ……… vertices of the quadrilateral. 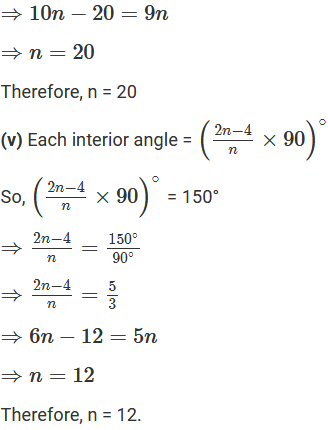 (ix) The sum of the angles of a quadrilateral is …. right angles. (x) The measure of each angle of a convex quadrilateral is ….. 180°. (xi) In a quadrilateral, the point of intersection of the diagonals lies in …… of the quadrilateral. (xii) A point is in the interior of a convex quadrilateral if it is in the ….. of its two opposite angles. (xiii) A quadrilateral is convex if for each side, the remaining …. lie on the same side of the line containing the side. In Figure, ABCD is a quadrilateral. The sum of angles of a quadrilateral is 360°. Let x be the fourth angle. Therefore, The fourth angle is 160°. A quadrilateral has three acute angles each measure 80°. 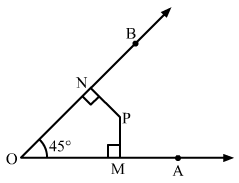 What is the measure of the fourth angle? Therefore, The fourth angle is 120°. Let x be the measure of each angle. Therefore, The measure of each angle is 90°. Therefore, The measure of each angle is 115°. Three angles of a quadrilateral are equal. The fourth angle is of measure 150°. What is the measure of equal angles? Let x be the measure of the equal angles of the quadrilateral. The measure of each angle is 70°. The four angles of a quadrilateral are as 3: 5: 7: 9. Find the angles. 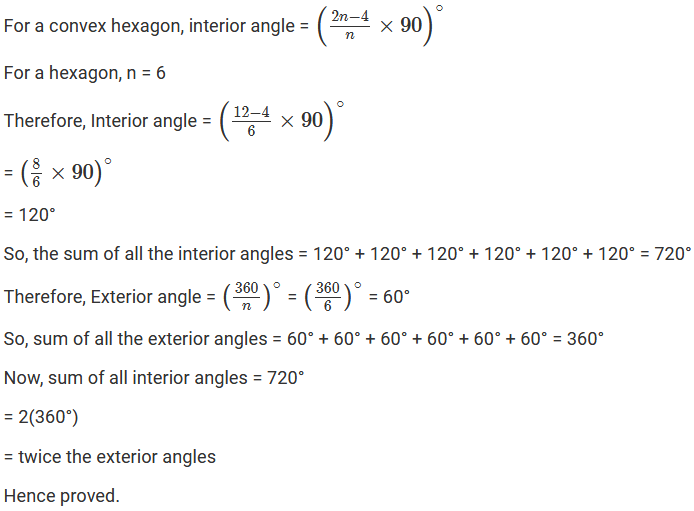 Let the angles be in the ratio 3x: 5x: 7x: 9x. Let (x + y) be the sum of the remaining two angles. Therefore, The sum of the remaining two angles is 180°. In Figure, find the measure of ∠MPN. The sides of the quadrilateral ABCD are produced in order (according to figure). Now, we need to find the sum of the exterior angles. 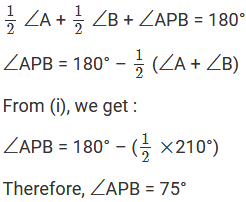 In Figure, the bisectors of ∠A and ∠B meet at a point P. If ∠C =100° and ∠D = 50°, find the measure of ∠APB. 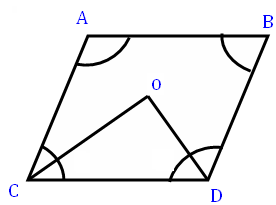 In a quadrilateral ABCD, the angles A, B, C and D are in the ratio 1: 2: 4: 5. Find the measure of each angle of the quadrilateral. Then the ratio becomes x: 2x: 42: 5x. In a quadrilateral ABCD, CO and DO are the bisectors of ∠C and ∠D respectively. 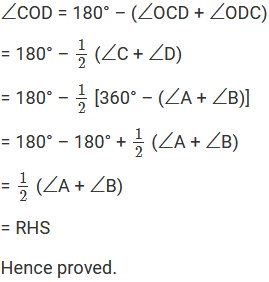 Prove that ∠COD = – 1 (∠A + ∠B). 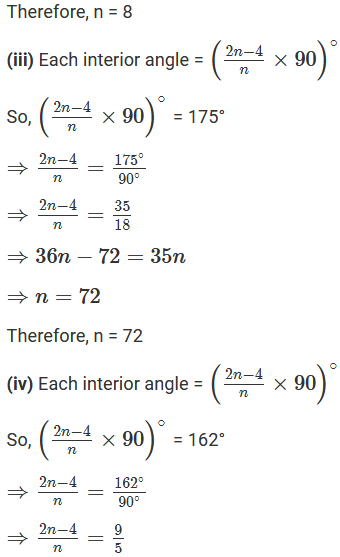 Find the number of degrees in each exterior angle of a regular pentagon. For a regular pentagon, n = 5. The measure of angles of a hexagon are x°, (x – 5)°, (x – 5)°, (2x – 5)°, (2x – 5)°, (2x + 20)°. 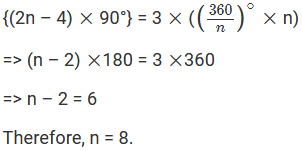 Find the value of x. The sum of the interior angles of a polygon is three times the sum of its exterior angles. Determine the number of sides of the polygon. Determine the number of sides of a polygon whose exterior and interior angles are in the ratio 1: 5. Let n be the number of sides of a polygon. Let x and 5x be the exterior and interior angles. The polygon has n sides. We know that the sum of all the exterior angles of a polygon is 360°. 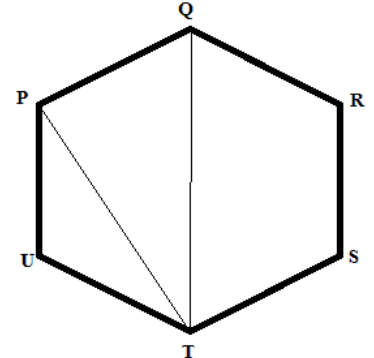 PQRSTU is a regular hexagon. Determine each angle of triangle PQT. A regular hexagon is made up of 6 equilateral triangles. 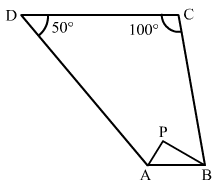 The angles of the triangle are 90°, 60° and 30°.